It’s hard to believe that Jeffrey Deitch censors artists. One quick look into his adventurous past incarnation as the director and owner of Deitch Projects in New York shows a guy who has championed the work of artists outside the mainstream and given them a forum to speak. Hard to see the same guy who mounted a burned-out meth lab by Jonah Freeman and Justin Lowe, (Black Acid Co-op) being queasy about offensive content. Did you ever see the parade he sponsored through the streets of Lower Manhattan for a few years? Don’t remember anyone crying censorship in those very public multi-membered panoplies of costume and conceptual art. The fact is there is a very public record stretching back many years that shows he routinely encouraged his artists to expand intellectually and explore new ideas regardless of how difficult or controversial they might have been. The public controversy of the buffing of a large wall on the side of the Geffen Contemporary Wing of MOCA by internationally known street artist BLU shortly after it’s completion last week feels more like an easy way to pile on him, maybe by those who didn’t like him in the first place. Sometimes people just like to see successful people fall. If you were to listen to the wailing of the Censorship Battalion you would have thought that Mr. Deitch himself had run screaming, bucket in hand, through the streets splashing paint on the mural and all over his pink suit, ranting about the dollar-draped coffins BLU had arranged in formation across the massive wall. But the timeline of how Deitch mismanaged the quickly exploding events after the buffing really points more to being obtuse than obstreperous. He didn’t handle the information communication very well. Looks like he made some rookie mistakes in his new position as the head of a major public institution of art. And? 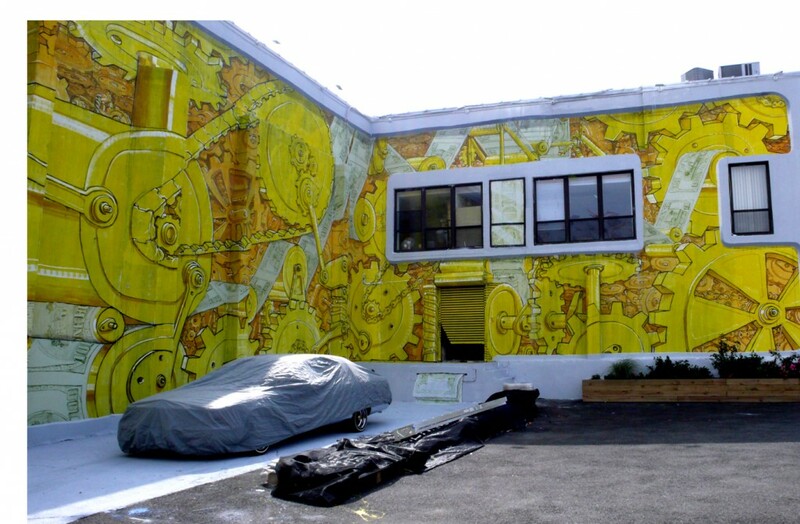 Only a year ago in October 2009 BLU finished another giant mural on the Deitch Projects location in Long Island City in Queens that some said was a fun-loving jab at Deitch himself. So it looks like this curator-artist relationship has some history. Censorship in this country, especially art censorship, is always a hot spicy topic – Why, did you hear about the Smithsonian? Less obvious is the ongoing sort of cleansing across our increasingly corporate mono-culture and this alien creature politics-as-sports media that exhausts the populace into confusion and conformity. That kind of censorship of the many gray areas simplifies everything to an Us vs Them mentality. Rather than the knee-jerk suggestion of boycotting his upcoming show of Street Art, let’s give the new guy a chance to acclimate to this new position he’s had for six months. That said, if Deitch was being sensitive to the Veteran Affairs neighbors and cognizant of the history of the Japanese community in the US, his timing was a bit late. And if we are talking about sensitivity and communication, it looks like BLU got left out of the equation altogether. How can this be? 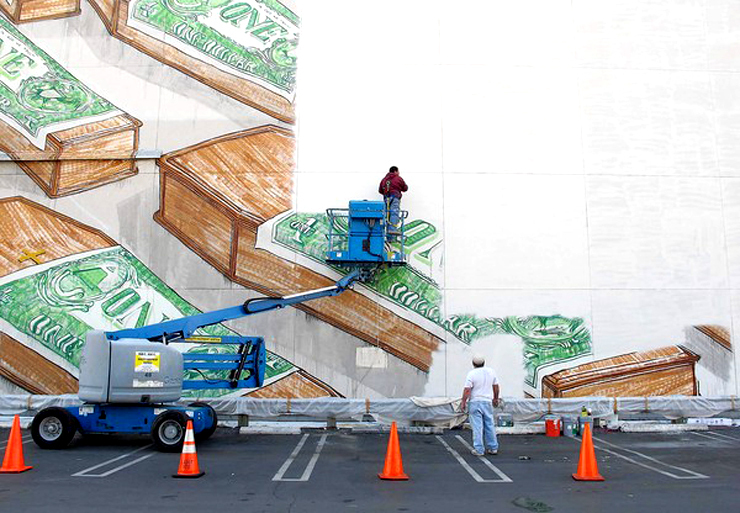 A very prolific artist travels to LA to paint a big commissioned wall and there wasn’t a sketch? We all censor ourselves every day. Sometimes for honorable reasons like not mentioning your co-workers’ deceased wife, or even pragmatic reasons, like rolling down your sleeves to hide your tattoos from your girlfriend’s dad. It’s all about context, and nuance. In the end, this microscopic chapter in Street Art is between BLU and MOCA, and only they know the contracts they have and the inner workings of their relationship. Maybe we can all find something else to speculate about.